Fire News: An Exploding Fire (Extinguisher?) Ball? 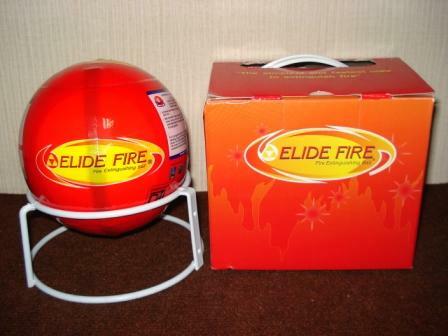 Elide Fire has a zany idea that might change the way that we fight fires in the future. These ball-shape extinguishers are like hand-held bombs that disperse the same chemicals that are found in normal fire extinguishers. To activate, you simply toss one toward the fire, and these little firefighters take care of everything. They are designed to activate within three seconds of being in contact with fire. They also work as alarms, emitting a loud sound when activated. You may be thinking, could these really work to replace fire extinguishers as we know them? Although having red balls filled with chemicals sitting in your kitchen or near electrical plugs may clash with your color scheme, they would be able to activate even when you’re not at home. This feature could potentially save lives as well as property damage (as long as they never accidentally activate without fire, though. That would be a mess!). The best part about this invention, however, is that it would be extremely easy to operate compared to a normal extinguisher. Using these extinguisher balls would be as simple as, well, tossing a ball. Even a child could do it (in a desperate situation, of course). Who knows, perhaps the fire training industry will soon have to create a simplified program that will more closely resemble pitching practice than fire safety training. The Extinguisher Ball has a lifespan of five years, and is meant to be mounted or displayed in fire-prone places. Total Fire and Safety is keeping an eye on this new product for further developments, but in the meantime, those basic red fire extinguishers hanging on your wall are your best bet in the event of an actual fire. For more information on fire extinguishers and wireless fire alarms currently available, contact Total Fire & Safety at 630-960-5060. Category: Fire Extinguishers, Fire Extinguishers, Fire News, Fire Safety, Total Fire and Safety, Trends Tags: alternative fire extinguisher, elide extinguisher balls, elide extinguishers, elide fire, Fire Extinguisher, fire extinguisher balls, fire extinguisher technology, fire fighting technology, fire news, fire rextinguisher bombs, fire safety news | Comments Off on Fire News: An Exploding Fire (Extinguisher?) Ball?